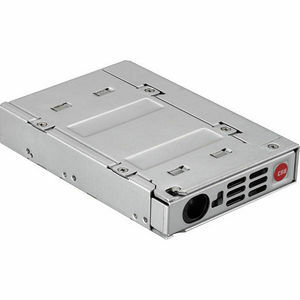 This rugged - yet elegant - metal drive adapter turns any SAS or SATA 2.5-inch hard drive or SSD into a 3.5-inch drive. Install anywhere a 3.5-inch drive can be used, or mount in a 3.5-inch ("floppy") bay in a PC for easy front-panel access. Using TrayFree™ technology, the one-touch drive ejection makes removing drives a breeze. With the push of a button, the drive smoothly ejects, without having to remove the adapter or otherwise open the computer. The heavy-duty metal construction is built to last and comes with the standard CRU high-quality insertion rating of over 50,000 cycles.